The cosmopolitan moon jelly Aurelia is characterized by high degrees of morphological and ecological plasticity, and subsequently by an unclear taxonomic status. The latter has been revised repeatedly over the last century, dividing the genus Aurelia in as many as 12 or as little as two species. We used molecular data and phenotypic traits to unravel speciation processes and phylogeographic patterns in Aurelia. Mitochondrial and nuclear DNA data (16S and ITS-1/5.8S rDNA) from 66 world-wide sampled specimens reveal star-like tree topologies, unambiguously differentiating 7 (mtDNA) and 8 (ncDNA) genetic entities with sequence divergences ranging from 7.8 to 14% (mtDNA) and 5 to 32% (ncDNA), respectively. Phylogenetic patterns strongly suggest historic speciation events and the reconstruction of at least 7 different species within Aurelia. Both genetic divergences and life history traits showed associations to environmental factors, suggesting ecological differentiation forced by divergent selection. Hybridization and introgression between Aurelia lineages likely occurred due to secondary contacts, which, however, did not disrupt the unambiguousness of genetic separation. Our findings recommend Aurelia as a model system for using the combined power of organismic, ecological, and molecular data to unravel speciation processes in cosmopolitan marine organisms. Speciation studies have nowadays been fueled by the implementation of molecular studies which often have led to substantial taxonomic revisions. The real value of molecular data is best exploited, however, if combined with morphological and ecological data to unravel evolutionary pathways of morphological change and phenotypic adaptations . Ecological differentiation in populations may force diversification and speciation  and it has to be determined whether phenotypic variation correlates to genetic and reproductive isolation. In marine environments invertebrate taxa in general show weak genetic structuring due to large population sizes, high larval dispersal capacities, the lack of physical barriers, and sometimes interspecific hybridization [3, 4]. Particulary in marine cnidarians sympatric speciation due to complex behavioral mechanisms and micro-scaled niche establishments is unlikely to occur. Thus, the study of factors such as population size fluctuations or environmental gradients that can promote allopatric speciation provides a promising approach to understanding speciation processes in widespread marine invertebrates . The moon jelly Aurelia (Linne) has attracted particular attention to taxonomists and ecologists over the past century. Mainly due to the high morphological variability in the medusa stage as many as 12 Aurelia species or sub-species were described earlier [6, 7], of which only two species were recognized by taxonomists . Based on morphological data the bulk of original species are summarized as a single species, A. aurita, which is deemed to be an ecological generalist and occupy worldwide habitats of all but north polar oceans. The second species, A. limbata, is seen as the boreal-arctic living counterpart. As in most cnidarian taxonomic conflicts, this one results from uncertain morphological characters (homoplasy), non-genetic plasticity in developmental patterns, and the paucity of diagnostic characters [8–10]. Recently, molecular and morphological data suggest several sibling species of Aurelia aurita including the formerly described A. labiata as an endemic species distributed along North American Pacific coasts [11–13]. The molecular genetic study of Dawson & Jacobs  suggests a remarkable high species richness possibly raising the number of Aurelia species to a total of 9 clades based on a global scale. These data call for an expanded global sampling regime and raise the question of how phenotypic and genetic divergences may be explained by environmental factors. In the case of the model system Aurelia we here contribute to the understanding of speciation processes taking into account two open questions: (i) the best suited species concept to be applied [e.g. [14, 15]], and (ii) evolutionary forces and mechanisms that promote speciation which include possible environmental factors demarcating species ranges. Since A. aurita is generally assumed to consist of temperature varieties [7, 8], we will examine whether phenotypic plasticity and genetic separation between geographic populations reflect climatic temperature gradients. Utilizing both mitochondrial and nuclear DNA sequence information from world-wide sampled specimens we also search for hints for hybridization that might have confounded morphologically based designations of Aurelia species [cf. ] We will discuss life history and ecological traits in the context of phylogenetic relationships and contribute to the value of phylogenetic species concepts [14, 16] for marine organisms in general. The 16S rDNA fragments varied in length between 477 and 481 bp and observed pairwise sequence divergences ranged from 0 to 14.5%. After mapping the most divergent sequences to the 16S RNA structure model we excluded homoplasy introducing regions which resulted in a total of 403 positions for subsequent phylogenetic reconstructions. The General Time Reversible model of sequence evolution taking into account rate heterogeneity (GTR+G, [17, 18]) provided the best fit to the reduced data set and was used to estimate genetic distances and to perform Maximum Likelihood tree reconstruction. Both tree building methods (Maximum Parsimony, Maximum Likelihood) revealed a star-like bootstrap consensus tree differentiating 7 distinct genetic entities which are supported by high bootstrap values (except, of course, for MCA which is represented by a single individual), several apomorphies and deep genetic distances (7.8–14.5% sequence divergences; corrected for multiple hits in table 2). For a better tree presentation a set of 21 haplotypes was chosen to depict the largest amount of genetic differences among individuals (figure 1a). Designations of Aurelia lineages were done according to characteristic distribution patterns and putative species names: members of the BOR lineage originate from boreal-temperate climatic zones whereas UBI consists of ubiquitous, world-wide distributed individuals, contrary to ARAB and TET individuals which derive from around Arabian peninsula and the potential Tethys Sea remnants Mediterranean Sea/Red Sea. In addition, LIM is named according to its morphologically characterized A. limbata sample, likewise the LAB lineage which harbor two morphologically characterized A. labiata samples (cf. table 1). Individual MCA-1 that originated from a tropical aquarium community (P. Mosconie, pers. comm.) is characterized by a highly divergent haplotype (11 apomorphies) and introduced a further putative genetic entity, lineage MCA. Both tree building algorithms revealed only slightly modified internal branching patterns. Parsimony analysis introduced short clade connecting branches, which dissolved to a polytomous origins in the Maximum Likelihood analysis. These unresolved interconnecting branches and star-like branching patterns, respectively, possibly suggest fast radiation rates, except for the two sister clades LIM and BOR which show closer relationships (figure 1a). The low bootstrap support for the BOR clade (53%) results from the exceptional simultaneous existence of two variable 16S rDNA alleles within the same individual EA-IS1. It must be noted here that Southern hybridization analysis contradicts the amplification of a nuclear integrated pseudogene and that the exclusion of allele EA-IS1/b increased the bootstrap support for the BOR clade to 92% (the significance of these findings will be discussed in detail elsewhere). Genealogy of Aurelia lineages based on 16S rDNA (a) and ITS-1/5.8S rDNA (b) sequences. The total number of mtDNA haplotypes and ncDNA alleles studied per lineage are given and their geographic origins are listed in fig. 1a (*the Mljet lakes samples group in mitochondrial LIM lineage but constitute a new lineage in the ncDNA tree). Branch lengths are drawn from Maximum Likelihood tree searches using substitution models (mtDNA: GTR+G, -ln Likelihood 1255.44, α = 0.15; ncDNA: HKY+G, TS/TV = 0.94, α = 0.27). Fig. 1a). Bootstrap values at branches derive from 1000 MP replicates, the dotted branches are only supported in MP analysis. Numbers in parentheses represent absolute numbers of apomorphic changes (Acctran optimisation, branch & bound search, 56 informative characters, CI = 0.86, gaps were excluded). Fig. 1b). Bootstrap values are from 100 ML/1000 MP replicates, heterozygous and hybrid individuals are marked by A and B alleles; Cyanea capillata is shown to have close relationship to the Aurelia LIM lineage (for further explanations see text). Sample sites of Aurelia specimens (N = sample size). *Previously identified as A. labiata; **previously identified as A. limbata; the remaining samples were identified as A. aurita. ***Clone MCA-1 derive from a tropical aquarium community (Pascal Mosconie, pers. comm.). Clone-IDs in bold represent polyps that were cultured alive in the laboratory. Further explanations are given in text. Mean genetic distances among genetic lineages and suggested species of Aurelia. Distances derive from GTR+G (mtDNA, upper half) and HKY+G substitution model (ncDNA, lower half). The diagonale shows ncDNA variability within lineages (except for MCA which is represented by only one individual). The widespread UBI lineage (California/Pacific, France/Atlantic and Mediterranean Sea, Australia/Indian Ocean and Japan/Pacific) is best regarded as A. aurita since the locus typicus (Linne) has been described from the Mediterranean. The LIM and LAB lineages represent A. limbata and A. labiata, respectively. Lineage BOR is designated A. borealis due to its exclusive occurrence in boreal climates. MKL lineage is absent in mtDNA due to introgressive hybridization (see details in text). The length of the ITS-1/5.8S rDNA fragment varied from 432 to 513 bp. A total of 354 positions including 150 bp of the 5.8S RNA gene were aligned after excluding uncertain positions (large indels, repetitive regions). Observed sequence divergences ranged from 0% to 32% which were corrected using the 'HKY' substitution model considering rate heterogeneity . Heterozygosity, mainly due to single base substitutions or deletions/insertions among individual alleles, was observed at a rate of 25%. Four individuals (6%) exhibited large intra-individual heterogeneity (6–27% sequence divergence) among alleles which is close to the maximum of overall observed divergences. MP and ML tree reconstructions revealed a star-like genealogical structuring similar to the mtDNA data and the same individuals (alleles) and lineage designations as described for the mtDNA tree were chosen to depict the phylogenetic relationships in ncDNA (figure 1b). Two main differences to the mtDNA tree deserve attention: (i) ncDNA data suggest that all individuals from Adriatic marine Mljet lakes (MS-MKL) represent a separate monophyletic nc-lineage (MKL, figure 1b) rather than part of the mt-LIM lineage; (ii) more unexpectedly, alleles of individuals within the nc-LIM lineage show close phylogenetic relation to the ITS-1/5.8S rDNA sequence of a member of a different family (Cyanea capillata; GenBank Acc. No. U65481), which was verified by sequencing a further C. capillata sample (the 16S rDNA from the same sample did not show any relationship to Aurelia, data not shown). Both findings suggest gene introgression events involving Aurelia female representatives of the mitochondrial LIM lineage. In addition, the phylogenetic reconstructions clearly group each pair of alleles of the 4 heterogenous individuals into different genetic lineages. 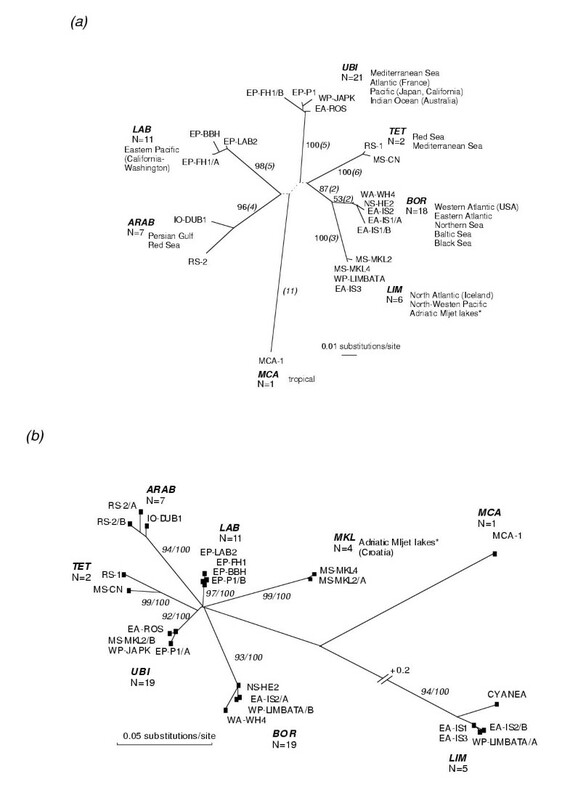 The latter suggests hybridization events among BOR and LIM lineages (EA-IS2/A+B, WP-Limbata/A+B), LAB and UBI lineages (EP-P1/A+B), and MKL and UBI lineages (MS-MKL/A+B; figure 1b). These hybridization events did not break down the clear evolutionary separation, however. The 8 ncDNA Aurelia lineages are well supported by high bootstrap values (except, of course, for MCA, represented by a single individual) and substantial genetic distances, ranging from 5% to 32% observed differences (for corrected values see table 2). Moreover, all examined individuals cluster concordantly with respect to the mtDNA phylogeny if specimens involved in putative hybridizations are ignored (Templeton rank sum test, p < 0.01). Genetic differentiation among mitochondrial haplotypes (N = 64, excluding samples BERLIN and MCA-1 with unknown origin) were tested for global distribution patterns along 10 defined sampling locations. First, we utilized an AMOVA design defining four major ocean groupings: 'Atlantic' (West-Atlantic and the zoogeographic unit East-Atlantic/Northern Sea/Baltic Sea), 'Mediterranean Basin' (France, Adriatic Mljet lakes, and Black Sea), 'Indian Ocean' (Red Sea, Persian Gulf, and Australia/Perth), and 'Pacific' (Japan and American coast). No significant variance components were detected among the four main sea basins, whereas 67% and 33% of the genetic variance were attributable to among and within sampling locations. A low Mantel correlation coefficient of r = 0.21 between genetic and geographic distances reinforces the hypothesis that isolation by distance poorly resolves genetic differentiation among Aurelia haplotypes based on a global scale. In order to test climatic influences on distribution patterns we grouped the 10 location sites into three climatic zones defined by minimum (winter) surface water temperatures: boreal 0–8°C (West-Atlantic, East-Atlantic/Northern Sea/Baltic Sea, and Black Sea), temperate-mediterran 8–19°C (Mediterranean locations, Australia, Japan, and American Pacific), and warm-tropical ≥ 19°C (Red Sea and Persian Gulf). The largest variance component (42%) was observed among the three climatic zones, followed by 31% within locations and 27% among locations. A Mantel correlation coefficient of r = 0.45 between genetic distance and temperature difference of sampling sites confirms that climatic factors provide more accurate descriptors of Aurelia phylogeography than an 'isolation by distance' model. 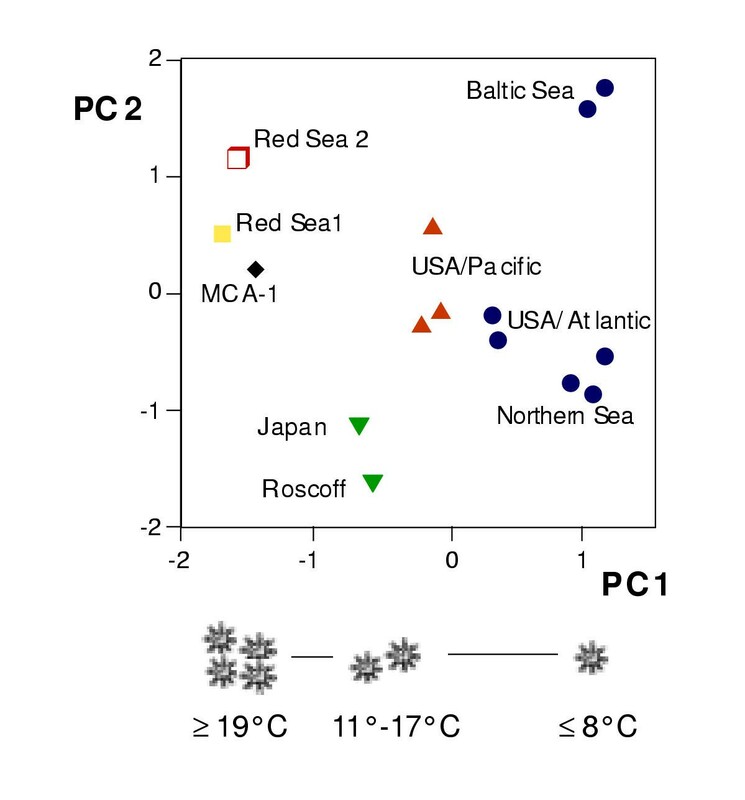 Moreover, minimum sea temperatures at collection sites differ significantly between mtDNA lineages (figure 2, U test, p < 0.05) which altogether suggest a strong climatic influence on genetic differentiation (comparisons to the TET lineage were not significant due to the wide range of its two representatives). Geographic distribution of mitochondrial Aurelia lineages. Three main climate zones divide the lineages into cold/boreal, temperate/mediterran, and warm-tropical temperature ranges. Minimum sea temperatures averaged from all sampling locations per lineage are given in parentheses (*excluding the 4 LIM-MKL hybrid individuals from LIM lineage in Adriatic Mljet lakes due to their untypical life history traits, see discussion). The geographic origin of the tropical MCA lineage (?) is unknown. Geographically separated populations represented by 15 lab cultured polyp clones differ significantly in life cycle traits. This is illustrated by reducing the variances of the 6 examined traits along two major principal components (figure 3). For example, polyps from the Northern Sea are substantially smaller than those from the Baltic Sea (7.4 ± 2.7 vs. 21 ± 11 mm3; p < 0.001, U test) but much more efficient in vegetative reproduction (ephyrae per strobila: 16 ± 2 vs. 4 ± 1; p < 0.001, U test). Noteworthy, the differential phenotypic groupings do not necessarily match the phylogenetic patterns. The three locations Northern Sea, Baltic Sea and Western Atlantic/USA are genetically unified by one lineage (BOR, cf. figure 2) and here phenotypic differences may represent environmentally mediated modifications. The latter is reflected, for instance, by larger polyp sizes of the Baltic Sea clones, which could be a result of lower salt concentrations (hypoosmotic medium). However, if one traces the first axis in the principle component analysis, which describes the bulk of phenotypic variance (59%, figure 3), a decrease from positive to negative values is seen. This coincides with a climate based mtDNA lineage distribution from cold to warm tropical temperature ranges as described in figure 2. Regression analyses suggest that 5 out of the 6 phenotypic parameters correlate significantly to minimum sea temperature at the field collection sites. No significant correlation was observed for the number of ephyrae per strobilae whereas polyp size (r = -0.57), budding rate (r = 0.71), and mobility of ephyrae (r = 0.85) were moderately correlated. Remarkably, the most directly fitness related efficiency of vegetative reproduction appears to be highly correlated to climatic factors: strobilation frequency, counted as 1–4 cycles/year(r = 0.98) and temperature for strobilation onset (r = 0.96; p < 0.001 in both cases). The latter suggests a genetic basis for phenotypic differentiation. Polyps of subtropical-tropical distributed lineages, TET, ARAB, and MCA, strobilated without experimental decreasing of ambient temperature at ≥ 19°C and throughout the year, polyps of the mediterran climate, UBI, strobilated two times per year (winter and late spring) and could be induced to strobilate at 11°-17°C. The boreal climate polyps (BOR) strobilated once a year, and only after a temperature lowering to ≤ 8°C (see figure 3). Principal component analysis of 15 polyp clones attributes 74% of the total phenotypic variance (of 6 phenotypic variables) to component 1 (PC1, 59%) and component 2 (PC2, 15%). Two important traits, strobilation frequency (ephyrae symbolize number of seasons/year) and induction temperature for strobilation onset, which coincide with mtDNA lineage distribution along PC1 are depicted. Symbols for mtDNA lineages are: • BOR, ▴ LAB, ▾ UBI, □ ARAB, ▪ TET, ♦ MCA; no data exist for the LIM lineage. The molecular data from this study revealed remarkably deep phylogenetic separations and the presence of at least 7 (and likely more) genetically isolated and ecologically distinguishable entities in Aurelia. Both the mtDNA and ncDNA data unravel deep evolutionary branches and 10–20 fold increased sequence divergences between lineages confirming the earlier suggested demarcation of the A. limbata and A. labiata species from Aurelia aurita[8, 12, 13]. In addition, we assign 5 further lineages (see table 2). In four cases, individuals harboring two highly divergent ncDNA alleles were grouped differently in mitochondrial and nuclear genetic lineages (the special grouping of the EA-IS1 individual, which harbors two different mtDNA haplotypes, will be discussed elsewhere). Most likely this variation derives from more recent hybridization events rather than ancestral polymorphisms. The alleles of interest unequivocally match present day alleles from sister lineages (figure 1b), which would not be expected if ancient alleles had persisted. Furthermore, the remaining concordant tree topologies contradict the idea of ongoing differential lineage sorting [20, 21]. Monophyly of the observed Aurelia lineages is unequivocally supported by several synapomorphies and high bootstrap values, which altogether have to be seen as the result of isolation (speciation) processes that affected the Aurelia genome as a whole [cf. .
Designating a species status can be a problematic task and the underlying concepts are subject of ongoing discussions [e.g. . In this study we strictly follow the genealogical approach [e.g. for several reasons: (i) here, biological species concepts [25, 26] are ill-suited because of the difficulty in observing hybridization, (ii) the molecular-phylogenetic approach allows the detection of cryptic species (; which applies for example for the two morphologically indistinguishable European lineages BOR and UBI), and (iii) the genealogical analyses from two independent loci unambiguously define Aurelia species entities through the absence of homogenizing gene flow, the presence of fixed apomorphic characters, and the concordant genealogical gene trees. Therefore our data are mostly congruent with the definition of 7 (mtDNA) or 8 (ncDNA) phylogenetic or cohesion species [27, 16]. The high degree of cladogenesis in Aurelia is confirmed by a recent study by Dawson & Jacobs . As in our study the authors sequenced the ITS-1 spacer region while examining the mitochondrial cytochrome oxidase I gene instead of 16S rDNA. Four out of 9 defined species (clades) were also found in our study due to overlapping sampling regimes: 1) A. labiata at Northeastern Pacific coast, 2) the Adriatic Mljet lakes lineage, 3) Aurelia sp.1 from California and Japan (UBI lineage, this study); we additionally sampled this lineage from Eastern Atlantic, Mediterranean Sea, and Australia/Perth and call it the original A. aurita due to its world-wide distribution, 4) the BOR lineage distributed at West-East Atlantic, Black Sea, Northern and Baltic Sea which has been called A. aurita by Dawson & Jacobs . The differential assigning of A. aurita to the latter two species should be avoided in a future taxonomic revision of the genus. Interestingly, the Dawson & Jacobs  study did not find any hints for hybridization among their 9 defined Aurelia lineages. One reason for this could be seen in a different definition of the A. limbata lineage among both studies. The A. limbata (LIM) lineage in our study, which has been defined by a specimen sampled from NorthWest Pacific and which was characterized by traditional phenotypic diagnostics (dark-brown coloured bell rim, anastomizing branching of radial canals; Hiroshi Miyake, pers. comm. ), is predominantly involved in hybridization/introgression events (BOR and MKL lineages). In contrast, the A. limbata lineage of Dawson & Jacobs  was defined by a North-East Pacific sample (Kachemak Bay). In addition, the A. limbata in our study shows sister clade relationship to the BOR lineage in mtDNA genealogy and a highly divergent status due to possible introgression (see below) in ncDNA, while the A. limbata lineage of Dawson & Jacobs  is more closely related to Aurelia sp.1 (UBI, this study) in both gene trees. Most likely the A. limbata lineage in the previous study represents a different species/clade which apparently do not hybridize with other Aurelia species. The remaining four clades of the Dawson & Jacobs  study derive from warm-tropical localities (Southern Atlantic, Indo-Pacific/Palau) other than the three warm-tropical distributed clades of this study (Red Sea, Arabian Gulf, tropical-unknown). It has to be determined by sequence comparisons if some of these clades match each other. So far, by integrating both studies a total of 13 Aurelia species must be considered in a renewed taxonomic revision of the genus. Phenotypic and ecological differences among Aurelia lineages may be explained by divergent selection [28, 2]. The environmental temperature has apparently been a determining factor favoring ecological diversification. In cooler habitats Aurelia may have adapted to lower temperatures for the onset of strobilation and to lower strobilation rates. The reduced efficiency of vegetative propagation likely is a consequence of the reduced, temperature dependent metabolism. Although we were not able to rigorously quantify our results experimentally (due to the limited number of polyp cultures) the variance partitioning and correlation analyses between genetic data and climatic factors supports this conclusion. The observation that some 42% of the genetic variance (AMOVA) is attributable to temperature related factors and that phenotypic differences coincide with mtDNA lineage separation along a potential climatic gradient (PC1, figure 3) is congruent with a 'divergence with gene flow' model and the idea that divergent selection has fueled speciation processes in Aurelia [cf. ]. Our observations support the hypothesis that thermal-adaptive modulation of the metagenic Aurelia life cycle has been a prominent factor for reproductive isolation and thus for developing species boundaries in Aurelia. The star-like pattern of cladogenesis (figure 1) suggests fast radiation due to selectional forces and/or bottle neck effects. 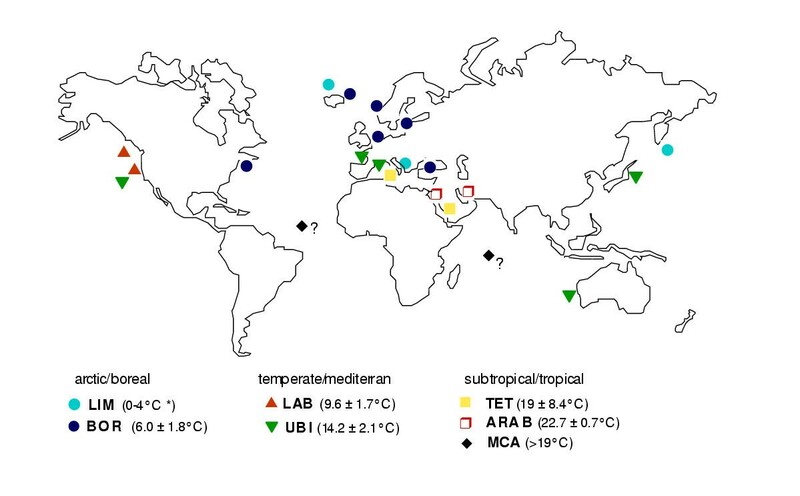 Given the highest genetic variability within lineages in warm tropical ranges (TET, ARAB; table 2) and the highly differentiated state of another tropical representative (MCA), these factors may have forced diversification especially in tropical climates. The latter is also supported by the description of several Aurelia sibling species in Palau/South Pacific . Sympatric speciation driven by differential adaptation to ecological factors is highlighted in a number of recent studies [e.g. [29, 30]]. Contrary, the distribution patterns of Aurelia lineages, which lack significant isolation by distance, suggest peripatric origins from a widespread ancestral population, whereas sympatric occurrences may reflect secondary contacts. An allopatric origin strictly by geographic separation may only apply to the LAB lineage (A. labiata) which is distributed along the North American Pacific coasts, and which probably has been separated from the Atlantic ocean by the closure of the isthmus of Panama in the Pliocene. Interestingly, one individual from Monterey Bay (California) has been identified as member of the UBI lineage whereas another specimen from San Fransisco Bay, EP-P1, harbored two different ncDNA alleles refering to the LAB and UBI lineages (figure 1b). The latter indicates recent hybridization events between A. aurita and A. labiata due to anthropogenic mediated secondary contacts, e.g. by shipping ballast water [cf. ]. A surprising finding that cannot be easily explained by ecological adaptation is the south occurrence of the more cold adapted LIM (as represented by LIM-MKL hybrid individuals) and BOR lineages in the marine Mljet lakes in Croatia and in the Black Sea (figure 2). Our most parsimonious explanation assumes a recently forced temporal range expansion followed by geographic isolation of relict populations. Cooling of the Mediterranean Sea at the end of the Pleistocene (due to compression of isotherms; [31, 32]) may have allowed invasion of BOR and LIM-MKL hybrid individuals from the Atlantic. Due to the postglacially rising of sea levels, the Black Sea could have been invaded by BOR individuals some 10.000 years ago  and the Mljet lakes by LIM-MKL hybrids some 4.000–7.000 years ago (Adam Benovic, pers. comm.). In present time both habitats show low temperatures in the winter (e.g. <6°C in the Black Sea), while the only migratory pathway, the Mediterranean Sea, is an isolating barrier because its lowest water temperature is several degrees °C above the strobilation induction temperature for BOR – and probably for LIM-MKL – individuals. This way the lineages remain captured as southern relict populations. For the LIM-MKL hybrid lineage, however, we do not know if the hybrid might tolerate a broader range of strobilation temperature than one of its cold adapted parental species, A. limbata. Our molecular data suggest that this hybrid lineage may be the result of hybridization between a LIM lineage female and a MKL lineage male followed by backcrossing events (introgression). The hybridization obviously has led to alterations in life cycle traits. Medusae of the Mljet lakes reach untypical sizes in umbrellar diameter (up to 55 cm) and are seen throughout the year (i.e. polyps strobilate year round; ). The potential of Aurelia lineages to hybridize (e.g. UBI × LAB, LIM × BOR, figure 1b) is highlighted also by the remarkable finding of phylogenetic proximity of the ITS-1/5.8S allele of Cyanea capillata to the Aurelia LIM lineage. Given the deepness of genetic separation between Aurelia lineages it is quite noteworthy that the observed sequence divergence between the LIM lineage and Cyanea is only about 3.5%, which would relate to a divergence time of some 2.8 million years, assuming an evolutionary rate of 1.2% per million years [cf. ]. It is unclear if reasons other than hybridization and introgression may account for this peculiarity. One possible alternative explanation, the amplification of ancient remnants, e.g. pseudogenes, seems unlikely since no other alleles were found in three out of five individuals of the LIM lineage. Further nuclear genes should be studied to test the hypothesis of introgression between these two taxonomically distinct families. Interestingly, cycles of species differentiation and reconnection by hybridization, known as reticulate evolution, have been shown to accompany speciation in Acropora. Given the hybridization potential in Aurelia we suppose that (a) a similar type of reticulate evolution has played a role in opening new ecological niches [cf. ], and (b) the loss of intraspecific gamete recognition  followed by the foundation of new genetic backgrounds may have contributed to the formation of new species. Molecular data of both, nuclear and mitochondrial DNA reveal deep phylogenetic branching patterns and the reconstitution of several species within the genus Aurelia. The high degree of cladogenesis calls for a taxonomic redefinition of Aurelia as a whole. Two important life cycle traits, strobilation frequency and temperature for strobilation onset, coincide with climate and genetic differentiation. Ecological data suggest that climatic adaptation may have forced diversification during evolutionary history. These results should stimulate further studies to target the causative molecular mechanisms, e.g. the role of heat shock proteins for temperature adaptation. Hybridization and introgression occurred among several Aurelia lineages, either more recently with the aid of humans or more historically due to secondary contacts accompanying ecological (e.g. glacially mediated) shifts. Hybridization did not break down the highly structured genetic differentiation. We propose that the compound action of hybridization and temperature dependent adaptations have contributed to the formation of the high species richness in Aurelia. The described processes may explain why this taxon has traditionally experienced difficulties in demarcating species boundaries. The findings recommend Aurelia as a model system for using the combined power of organismic, ecological, and molecular data to unravel speciation processes in cosmopolitan marine organisms. A total of 66 specimens was collected and received either directly from field cruises (medusae and polyps) or from laboratory polyp cultures originated from world-wide coastal areas in order to cover the ubiquitous distribution of the taxon (table 1). Except for the marked specimens (table 1) from Friday Harbor, which were morphologically recognized as A. labiata (Claudia Mills, pers. comm. ), and one sample from the North-Western Pacific, which has been identified as A. limbata (Hiroshi Miyake, pers. comm. ), all medusa samples were previously identified from their collectors as A. aurita. The latter was done according to morphological features, e.g. shape of gonads and canal branching patterns . Determination of polyps was achieved either from field observations (i.e. exclusive occurences of A. aurita medusae during spawning season) or through raising planula larvae from brood pouches of captured female medusae. In order to study life cycle traits, 15 randomly chosen and available polyp clones (drawn in bold, table 1) were cultured in our laboratory during a period of 1.5 years at 19°C ambient temperature, 16‰ and 34‰ salinity (Baltic Sea and all other samples, respectively), 12 h daylight regime, and a feeding regime of two times (ad libitum) a week with Artemia larvae. DNA was extracted from all specimens using standard procedures, i.e. tissue was homogenised in proteinase K containing Tris/EDTA buffer followed by a single phenol/chloroform/isoamyl alcohol extraction and ethanol precipitation [e.g. ]. DNA templates (1–10 ng) were subjected to PCR in 25 μL total volume of 1 × PCR buffer (20 mM Tris-HCL, pH 8.4, 50 mM KCL), 2 mM MgCl2, 0.1 mM each dNTP, 4 pmol each primer and 0.5 U Taq polymerase (Gibco BRL). Cycling profile on a 9600 GeneAmp thermocycler was 35 cycles of 30 s at 90°C, 30 s at 51°C, and 50 s at 72°C. After sequencing one Aurelia sample that had been amplified with 16S rDNA cnidarian primers known from Cunningham & Buss , specific Aurelia primers were designed: L5'-CTC TTG TAA GGT GAA GCC and H5'-CAT AAT TCA ACA TCG AGG. Specific primers encompassing the ITS-1/5.8S rDNA region were designed from existing 18S rDNA (A. aurita, GenBank Acc.No. U19541) and 5.8S rDNA sequences (C. capillata, GenBank Acc. No. U65481): F5'-TAA CAA GGT TTC CGT AGG, R5'-CTC AGA CAG ACA TGC TCC. Gel-purified products were sequenced either directly (16S rDNA) or cloned prior to sequencing (ITS-1/5.8S rDNA). Inserts (3 plasmid clones per individual) and PCR products were cycle sequenced using Biotin Sequencing Kit (GATC, Konstanz) or BigDye Terminator Kit (Applied Biosystems) and electrophoresed on a direct blotting electrophoresis apparatus (DBE, GATC) or an ABI 377 automated DNA sequencer. Sequence data from Aurelia lineages have been deposited in GenBank (Acc. Nos. : 16S rDNA: AF461398-AF461404; ITS1/5.8S rDNA: AF461405-AF461412). DNA sequence alignments were done using Clustal W  followed by manual corrections using a secondary structure model of the Aurelia 16S RNA gene which was derived from a hydrozoan, Eleutheria dichotoma, model [cf. ]. Highly variable ITS-1 regions were excluded from subsequent analyses if no alignable columns between sequences were found. Observed pairwise sequence divergences were corrected using a base substitution model which best fitted the DNA data by applying a likelihood ratio test (implemented in Modeltest V 3.0; ). Phylogenetic hypotheses were reconstructed by Maximum Likelihood (ML) and Maximum Parsimony (MP) analyses followed by bootstrapping using PAUP* V 4.0b4 . Genetic variation among all specimens was examined by analyses of molecular variance (AMOVA) using pairwise mtDNA sequence differences (Arlequin V 2.0; ). Pairwise correlations between genetic and both geographic and climatic distances were tested for by means of the Mantel test (geographic distances were estimated from lattitude and longitude, and differences in minimum (winter) sea temperature between collecting sites were taken from climate maps; http://ingrid.ldgo.columbia.edu/SOURCES/.LEVITUS94). Significance of variance components and pairwise correlations were tested by 1000 permutations of the data set. For the 15 live cultured Aurelia clones six typical life cyle traits from polyp (30–300 individuals per clone) and ephyra stages were measured during a period of 18 months: mean polyp size (in mm3), clonal reproduction rate (mean number of individuals per time unit), temperature at the onset of strobilation (after successive decrease from 19° to 4°C during 3 months periods), frequency of strobilation (deduced during unchanged as well as experimentally decreased temperature regimes in number of seasons per year, coded as 1–4), mean number of ephyrae per strobilation, and mobility of ephyrae (slow, medium, fast, coded as 1–3). Variability of all parameters among clones was tested by means of principal component analysis. Phenotypic traits were tested for dependence to environmental data (minimum sea temperature at field collection sites) by means of linear regression analysis. We thank Anna K. Danielsdottir and the 'Marine Research Institute Iceland' for collecting samples from Iceland, and Adam Benovic for providing samples and most valuable information on the history of the Mljet lakes. We also thank A.J. Gong, C. Mills, U. Luth, P. Groves, R. Rippingale, C. Lehmann, M. Sakaguchi, H. Miyake, P. Mosconie and P. Morniere for providing samples from around the world. This research was supported by the Deutsche Forschungsgemeinschaft (DFG Schi-277/10-2) and the Deutsche Bundesstiftung Umwelt (scholarship for W.S. ).